For those of us who think it's very likely that technology's accelerating pace of advance is soon going to become too rapid to follow, developments like this one already seem quaint. You know what it's like to look nostalgically at photos of computers from the '50s, or old ads for magical household appliances. In a few years that's exactly how it will be to go back to articles about robots like REEM-B. A new humanoid robot called Reem-B was unveiled on Wednesday at an event on Reem Island in Abu Dhabi, the United Arab Emirates. 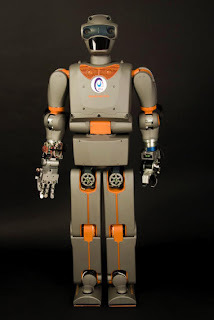 The Reem-B robot from Pal Technology Robotics is capable of face recognition, speech interaction, biped walking, traversing stairs, and sitting (see video below). It can also recognize and pick up objects, as well as evaluate and map out a room to better navigate it. Reem-B stands at 4'10" (1.47 meters) tall and weighs about 132 pounds (60Kg). It can carry up to 26 pounds (12Kg) in its arms and walk at a speed of 1 mph (1.5Km/h). It can also climb stairs. Using a main CPU that consists of a Core 2 Duo (1.66GHz) and a Geode (500MHz), the robot can operate for about 120 minutes before its battery needs to be recharged.